Hot Chocolate Pretzel Rods are a delicious winter treat! If you’re looking for a fun wintery treat, I have just the thing for you. Hot Chocolate Pretzel Rods! They are super easy to make and will satisfy both your salty and sweet cravings! 1. Place your chocolate chips in a microwave safe bowl and heat on 50% power for 4 to 5 minutes, stirring every 30 seconds until the chocolate is completely melted. 3. Dunk your pretzel rods 3/4 of the way into the melted chocolate. Let any excess chocolate drip off and place onto a parchment paper lined plate. 4. Transfer your pretzels to the freezer for about 15-20 minutes to let the chocolate harden. 5. Place your white candy melts in a microwave safe bowl and heat on 50% power for 3-4 minutes, stirring every 30 seconds until melted and pour into a piping bag and cut a tiny tip off the point of the bag. If you don’t have a piping bag, a Ziploc bag will do just fine. 6. Remove your pretzels from the freezer and drizzle your white chocolate over your chocolate covered pretzels. 7. Immediately press your marshmallow bits onto the white chocolate while it is still soft. 8. Let that for another 15 minutes until the white chocolate has completely hardened and enjoy. I made a bunch of these Hot Chocolate Pretzel Rods to send into work with my husband the other day and I was told they were a huge hit! Hope you get a chance to make some Hot Chocolate Pretzel Rods for yourself. They really are a yummy winter snack! Those look so cute! I’ve never seen the Jet-Puffed Mallow Bits. I’ll have to look for them. I still have some almond bark in a pan with a lid over it. This would be a great way to use it up! Those look yummy! It’s easy enough to do and it’s got that salty sweet taste all at once. That is my favorite kind of dessert. This such a great take on an old favorite. Adding the marshmallows to finish it off was GENIUS. I just made chocolate pretzel rods the other day. I’ve never thought about making a hot chocolate pretzel before! This is the kind of treat that I love most! There is something so mouth watering about the salty/sweet combination – and love how easy they are to whip a batch up on a whim! I love this idea! It looks so easy and yet so pretty. I bet my holiday guests will love this treat on the weekend. 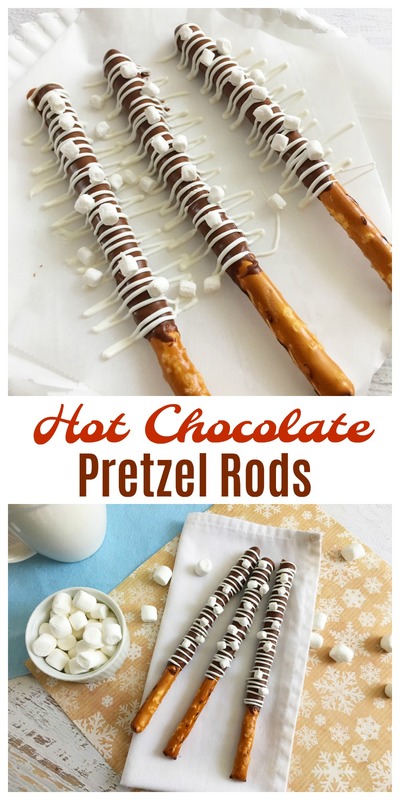 These Hot Chocolate Pretzel Rods look so yummy. I’m sure they will be a big hit with my family. I’ll have to make some up this week. Very cute idea!! These pretzel rods look and sound so fun! YES PLEASE! Anything hot chocolate and I’m in love with it. These look so good. I love this idea. I don’t know if I would be able to stop snacking on them they look so good. These sound so tasty! I can’t wait to do our final shopping trip for our holiday snacks and drinks. Hot chocolate pretzel rods would be great! I love how easy this is to make! Such a perfect snack and holiday treat! I love recipes that are sweet and salty. I think I might make these for the kids on Christmas eve. I’m all about sweet and salty and your pretzel rods are so pretty and seem easy to make. 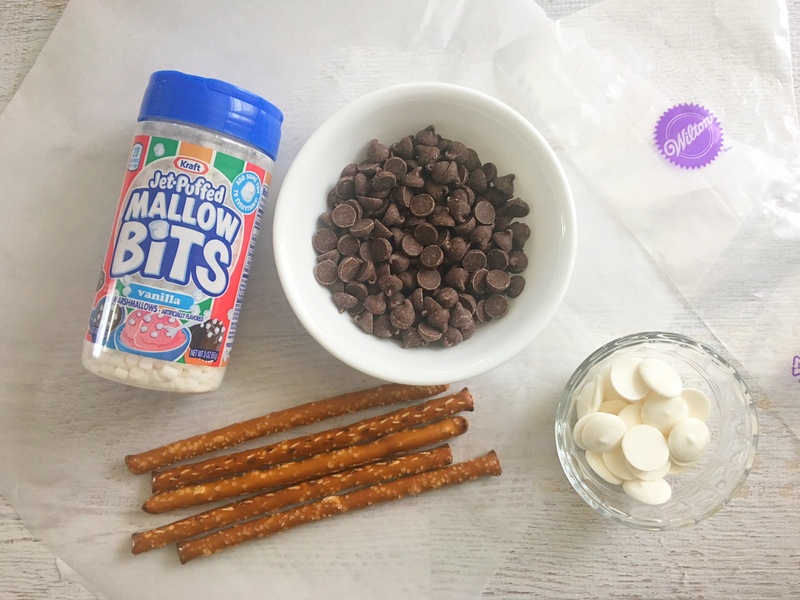 I love how you added the marshmallow bits – so festive! Loooove chocolate and pretzel and this is such a great idea for a winter treat! You can totally wrap these up and put them in stockings, too! A person can do so much with pretzels. We have made these and put them a decorated hot chocolate basket. Always a big hit. Yum, these look delicious. I do love my hot chocolate. And pretzels. And regular chocolate. So these would be perfect. I need to make them soon. I tend to buy chocolate pretzels at Target, but they’re so overpriced and probably not as good as these. l love pretzel rods dipped in chocolate. That salty sweet combo is always so tasty! What a terrific winter spin on the chocolate pretzel rod! What a different take on chocolate dipped pretzel rods. We usually dip our in chocolate and the kids drown, I mean sprinkle them with sprinkles. I’m not a fan of the whole sweet and salty taste. These do look really good. I think I’ll give it a try. This would also be something fun to do with my nephews. This is a great idea. It’s really cute looking treat and a great way to combine sweet and salty! This would be a wonderful teacher gift! I would be fun to give with a tin of hot chocolate. What a cute way to dress up some pretzel rods! I love that they are hot chocolate flavored!! YUM! I love how you decorated the pretzel rods! The hot chocolate flavored is a great addition to a favorite way to eat pretzels. Love this! Can we let the first part chocolate sit out and harden? I know it will take longer, but having a small freezer stinks! lol. You’ve just taught me something new. These are great for gifts and really taste delicious. I’m glad I know how to prepare them now. Oh so nice and festive looking! I will save this idea and make them for our New Year party. My children and their friends would love this. Perfect for movie nights with the family too. These look so delicious. We love the salty sweet combo of chocolate dipped pretzels! Have to give this recipe a try. Those do look like a whole lot of fun. 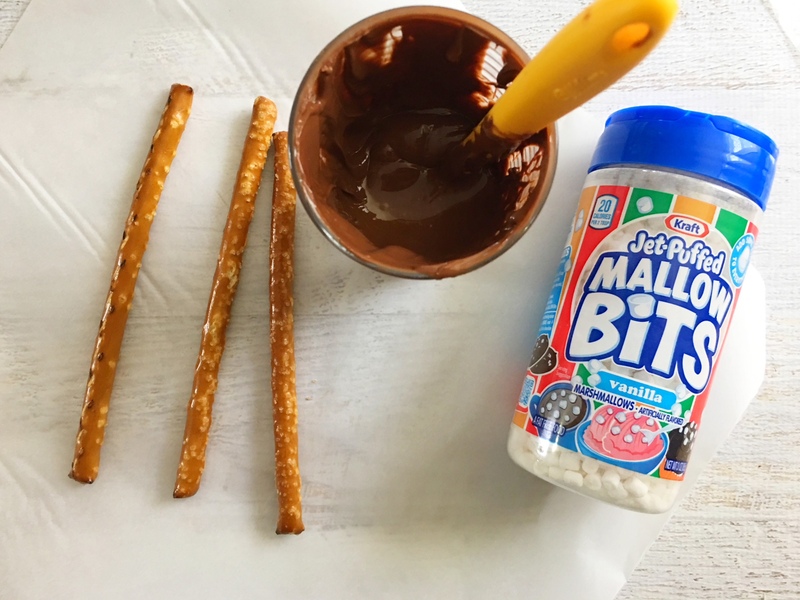 I wouldn’t have thought to put marshmallows on them, but I can see why that would be a nice tasty match for the pretzel sticks. These look delicious. My kids will absolutely love them. Thanks for sharing!